April 25th: Just a quick note and some photos. We think we see a summit window and will leave BC the morning of the 27th and summit the morning of May 1st give or take a day. Of course, no guarantees but so far the forecasts agree. We had a resupply helicopter during a snow storm yesterday; henceforth referred to as the deli-copter. I'm pretty sure the pilot had less than 300m visibility in our little canyon but knew he could drop below the cloud right out of camp. Pretty exciting when all we've been doing is bouldering and eating for the past week. 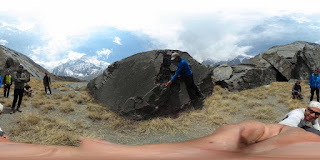 Speaking of, attached photos: We've got a dozen boulders with a couple dozen routes around camp and are ready to write the Annapurna I North BC bouldering guide book. I'm learning bad Russian, German, and Italian bouldering directions and supplementing bad Spanish and English. 1st photo should be our mini-climbing-UN 360° photo on a 10m traverse. The next photo credit goes to the Spanish team from just above camp 2. 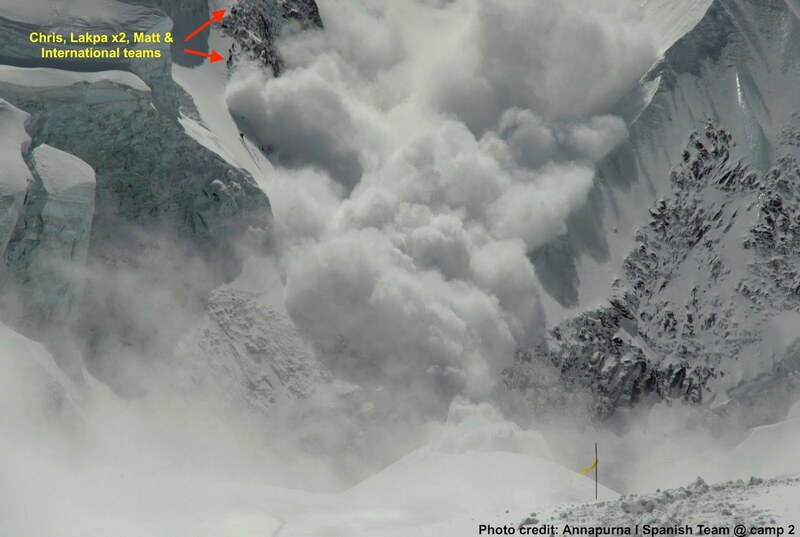 The avalanche is in the infamous gully between C2 and C3. In my last blog, I mentioned this gully goes every few hours and we watched this river of snow pass just hundreds of feet beneath us. Well, one of the Spanish cameramen at C2 caught this incident I was too busy and wide eyed to get my own camera out for. 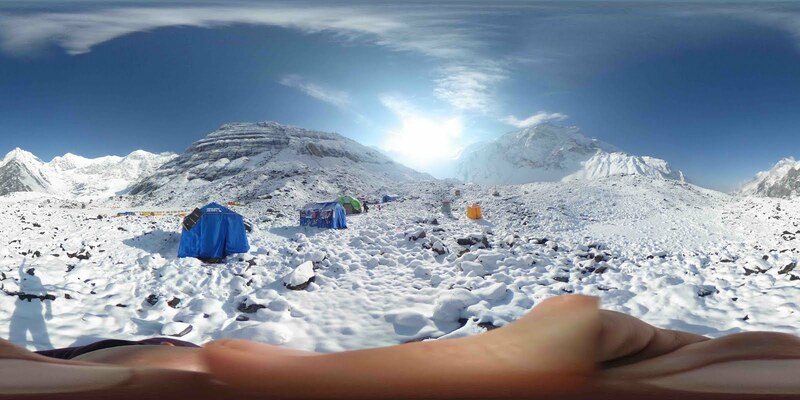 The last 360° photo is right after the snow storm that the deli-copter landed in; sunset lit up the side of the summit and the 100kmph plum of snow blowing off the summit. I have video of this beautiful, fiery cloud in motion I'll share when I get back. Also, you can see my tent serving as an anchor to a set of prayer flags for a friend. Today is the 1st anniversary of the earthquake so we'll be holding a quick puja for fallen friends here. Sending love to Garrett, Alan and many others over at EBC today. Thanks to Altitude-Seven.com and Michael Fagin for weather! I'll check the report tonight and if the post-jetstream snow storm is kind, we're a go! 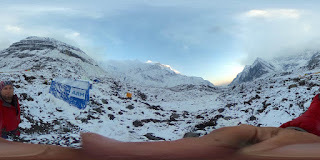 April 16th: We descended from camp 3 to base camp today. After several forecasts showed a slight lull in the winds for the 15th and 16th from 5 days out, every expedition on Annapurna 1 decided we'd been sitting at base camp for far too long and that even if the summit winds were a bit higher than we'd like, we should at least put ourselves in position to summit in case they were tolerable. During our two days at C3, we wavered back and forth on going up to C4 and beyond at least half a dozen times. We went to bed both nights expecting that we'd get an early start to head up the next morning only to be met with higher wind gusts than expected. Half a dozen members of the 7 Summits international team went up to C4 yesterday and started for the summit around 10pm. When we woke up, we were just receiving word that they had turned around at dawn after walking all night, facing in to 65kmph (40mph) winds. With forecasted wind speeds rising, two nights of acclimatization at C3 and a tent and gas dropped off at C4, we decided to descend and wait for a potential weather window next week. As we descended, we watched as the plume of spindrift off the summit extended further in to the deep blue sky, confident that we did not want to be up there. The journey up to C2 from C3 was intense (camping, it "in tents"). With over a dozen climbers expected to move up on the 14th with us, we got a jump on them and started before dawn. The good part of this decision was we weren't stuck waiting for slower climbers in difficult sections; of which there were many. The bad part was, Lakpa and I were number one and two breaking trail in the deep snowy sections and kicking front point, steps in to bullet proof, blue ice on the steep sections. This is both a point of pride that I had the energy to do so but also pain as using your crampon front points on steep ice with a heavy pack for 9 hours is a trial of body and will beyond most activities I know. The only test of will I can compare it to is playing Chutes and Ladders with a 4 year old for two hours straight. 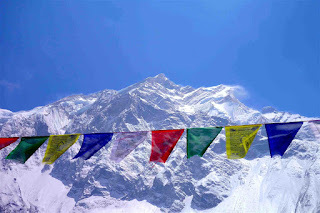 Those familiar with Annapurna know it is one of the deadliest mountains due to its high risk of avalanche. My brother asked me about my opinion about our exposure moving up to C3 and I responded; this route has improved over time to minimize crossing the very obvious avy lines. The gully alongside the route lets a few hundred tones of ice go every few hours and being 100' above the intense mass of ice, snow and air when it does go by is like watching a flash flood pass beneath you. The sound, pressure and speed have us both reaching for our cameras and clinging to the rocks and ice around us with wide eyes and mouths agape. We are relatively safe on this route but the margin might require a few folks to change their pants at C3. Speaking of… things not to write home about until safe at base camp. On this rotation we had some close calls. I mention them not to dramatize what we're doing but as cautionary tales that we were able to easily navigate thanks to lots of reporting, sharing and reading about adventure and climbing in journals like AINA from AAC, Explorers Web, etc. We had a near tent asphyxiation, a near rappel off end of rope and did some glacier travel in gym shoes. Ok that last one is just showing off. We ditched our giant 8000 meter boots at 5000m because 8000m boots below 5000m are a fashion faux pas. Really, because the ice falls back to BC were so melted out, it was almost no challenge to do in approach shoes. Some of the crevasse jumps grew to nearly two meters (with a pack on) so we got to reroute the fixed lines a few times. Tent asphyxiation can happen when too much snow piles up on the tent and isn't cleared to allow ventilation, usually at night when people are sleeping. 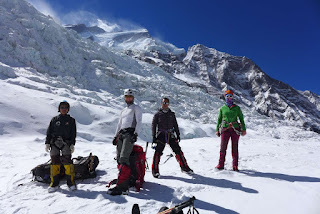 My 2009 Everest expedition team members will recall the two meters of snow we got in one night after we summited and thought we were out of harm's way at base camp. We owe Mike Horst for staying up all night an rattling our cages to clear our tents every few hours. It also occurs when stoves are used in the tent without enough ventilation. In this case it was a little of both. Ceiling and floor vents on our tent were wide open but with two stoves on full blast and snow piling up, Lakpa an I started to feel really sleepy and got symptoms of AMS. Situational awareness prevailed. We reacted quickly when we realized the symptoms were shared. I used to be baffled as to how people would burn stoves without proper ventilation. Now we know just how much ventilation two stoves going full blast need when it is snowing. And, I didn't almost rappel off a fixed line but again, countless reports of this and a similar, easily avoided tragedy by far more experienced climbers have left us with a hyper awareness not to let our guard down when exhausted or doing something routine. I was rappelling a fixed line from C3 over a shoulder of steep blue ice and couldn't see the bottom anchor from the top but I kept glancing behind me rather than just at my crampon placement in front of me. When the dangling, severed end of the rope came in to view I was none too pleased but left a safe-ish margin from the end and then pendulumed over to an older fixed line, pulled up the end of my current rope and with one hand always braking my belay device, tied a knot on the end with my teeth and load transferred both my backup safety and belay device on to the older rope all while on the front points of my shiny new crampons. It takes a tremendous amount of energy to stand and transfer loads in this precarious position but lots of reading, engineering and training from my big wall guide in Yosemite became very useful. This is all to say, what we're doing can be dangerous but climbing safely is as much problem solving, reading and awareness as it is training and athleticism. Many of my friends and colleagues noticed I was a bottomless eating machine the month before heading out. I'd like to think the the 9kg (20lbs) I packed on in advance of this expedition was all muscle but with the San Diego craft beer scene being what it is, I'm not that naive. The best part of prepping training for any expedition is trying to get the scale to go up instead of down, all while enjoying cycling and bouldering. Every cheese plate and fair-trade, chocolate desert on the menu fell victim to my 1st world gluttony. With all of the time spent eating our lovely base camp food, I was starting to question this pre-game weight gain. In the last 5 days, I'm pretty sure I've shed almost half of it. I had to adjust the velcro band on my soft shell pants but I'm still glad I don't have a mirror or a scale. No need to obsess, just eat good food. This is emotional well being and perspective over petty, ethnocentric social norms. Also, we look strangely on those that smell like soap and laundered clothes. Since this rotation was a possible summit push in bad weather, we carried a C4 tent and enough food and fuel to spend a few extra days at C3. 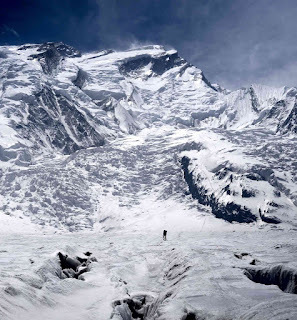 Its a bummer we have to repeat the arduous trip above C2 again but the great news is, our camps are well stocked and we even cached some gear that is specialized to specific parts of the climb. We may only use a camp 4 tent for about 9 hours but it is nice to know it is waiting there with our fuel an O2. Our next trip, we'll be lighter, faster and better acclimatized. I expect we'll make it to camp 2 in less time than it took us to get to camp 1 on our first rotation. All of this is just putting one foot in front of the other and repeating. I guess balance, temperature and hydration awareness are pretty key but it when we're up here for a month, it is easy to lose perspective. On the exhausting single push from C3 to base camp through familiar terrain, it is easy to put your head down and push through it. There are those moments where you stop and smell the ice though. As this mountain melts around us and we were walking through the expanding crevasse field between C2 and C1, I snapped out of the routine-ness of it all for a second and realized where I was. 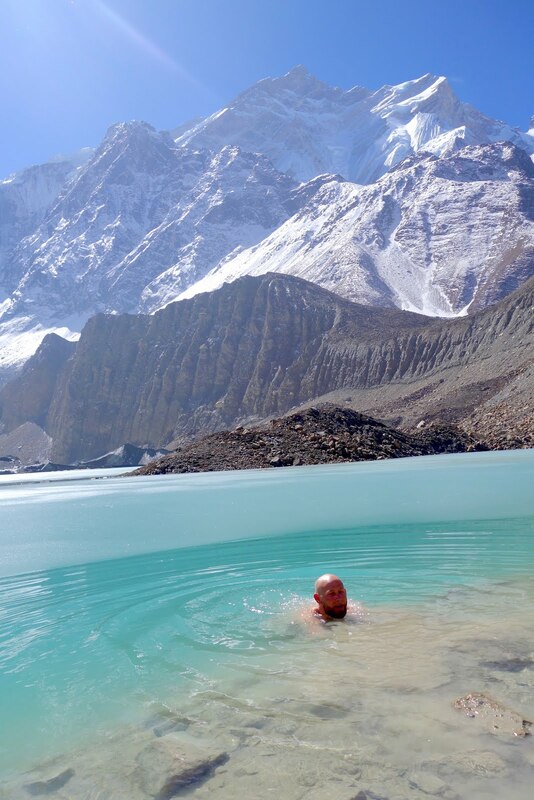 How often does one get to walk amongst these giant blue cracks over a flowing sea of ice below one of the most famous, beautiful mountains in the world? This is not the walk in the park my vessel has adapted to. This is a dance, an adventure of a life time. We all struggle to spend our intellectual and physical currency on experiences instead of things. I'm impossibly lucky to have the support and wherewithal to chase this silly dream. Whatever happens, this energy well spent. Thank you all. 1. 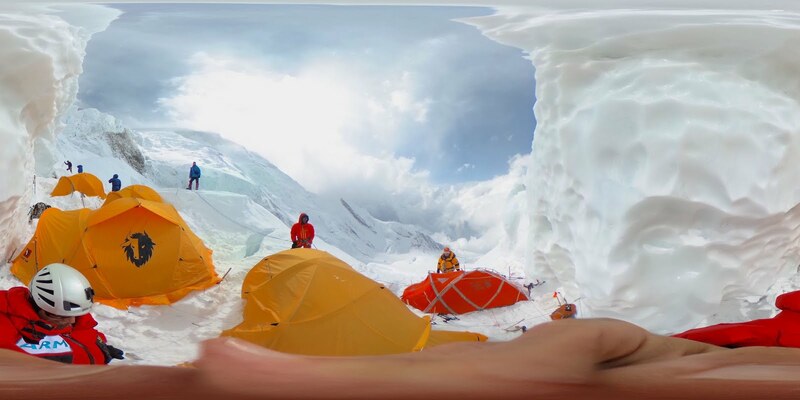 Arrival at Camp 3, 360°; You can see Chris arriving by Jost's tent at C3. You can see there is very little space. The flattened, distorted jpeg can be used in various image viewers to pan around an undistorted 360° space. i.e. Google Photos app on any touch screen device (even more fun with an accelerometer or VR device). 2. Stop and smell the ice; Pemma crossing the glacier above the ice fall between C2 and C1. It has melted considerably in a few days which is why the climbing season on Anna I usually ends with April. You can see the line we take up to C2 very clearly, the ice fall up to C3 (and gully) directly left of C2, the broken snow ramp to C4 in the upper left of the photo and the snowy traverse to the right and summit in the middle, top. 3. I'm with the band (photo credit: Lakpa Sherpa). From left to right: Oong Dorji, Matt Du Puy, Lakpa Timba, Chris Burke. 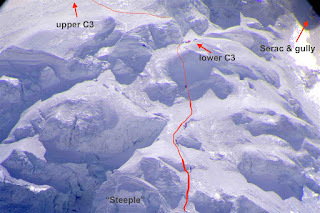 At the edge of the icefall below C1. Windy Anna I summit in the background. And Michael Fagin for the most accurate forecasts and staying up odd hours to communicate them. Thanks to my colleagues at ARM for, well, everything. The time and understanding to chase this experience. The gadgets powered by ARM to record them. The bandwidth to share them. Thanks to my family and friends who always encourage, find the positive and tolerate my BS. I love you. Hands free bouldering comp. There are some lovely bouldering problems around BC. 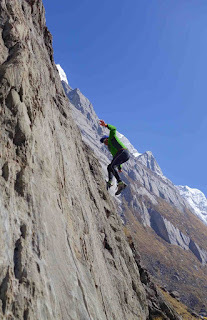 Lakpa, who has won a national rock climbing competition and climbed with Anker, deftly solves this problem without hands and without rock climbing shoes. 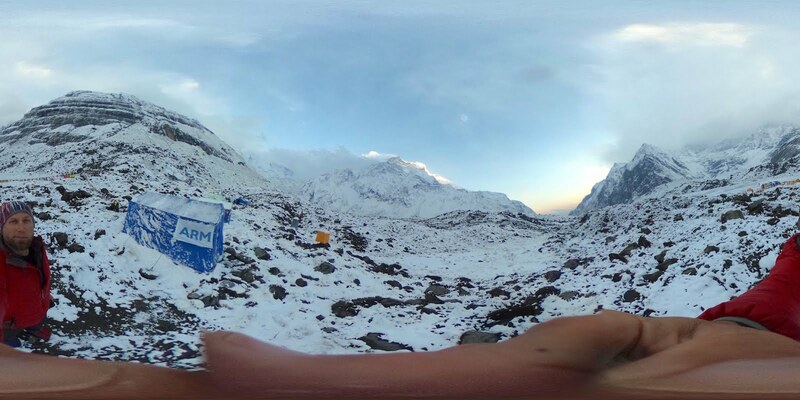 360° Photo of basecamp in the snow. The Climb: It has been a while since I've posted. I'm firing up the sat modem to check weather but you're getting this brain dump in addition since so many people have been asking what is going on and want photos. Forecasted and observed winds above 6500m have been extreme; 70-100+kmph. A few forecasts have hinted at small breaks but have been unreliable. We've got another hint of a dip pretty far out (13th). We're not getting summit fever about it until we get a lot more data but some of the young climbers and climbers on a tighter schedule are. The old saying, "there are old climbers and bold climbers." We're hoping to be the latter. Along with Norwegian, Nepali, Swiss and other global forecast sources, our amazing friend and fellow Everest club member, Georgina at Altitude Seven, is correlating those and another, traditionally reliable, source we don't have access to. We'll hope to have a better idea of how closely a snow will follow this dip in the winds within 24 hrs. A lot needs to happen between now and then though. There is a huge serrac to cross between C3 and C4 that halted sherpa from another team a few days ago in high winds. The likely solution to this problem will be to descend in to a crevasse and then climb up the overhanging serrac. Winds at 8000m are forecasted to dip to 30-40kmph. This is not ideal but tolerable. Those winds will be cold and coming at the face we're climbing. All conditions need to be evaluated on the spot but in general, I turn around when winds get above 65kmph (40mph). Winds that high have a tendency to knock one off balance and the windchill makes me cranky. When we do make a summit push, we'll likely spend a night at each camp on the way up save camp 4. We'd arrive there in the afternoon and start a summit bid that night. The good: we're healthy and really well acclimatized to BC. 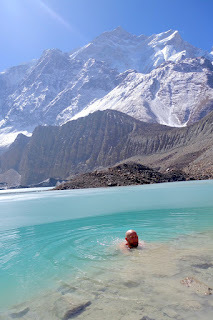 Every day I run up the hill behind BC topping out close to 5000m. That might have taken 3-4 hours when we first arrived and I'd have a massive headache. Now it takes me one hour and that is with stops when I run across sea shells. Also, instead of pressure breathing to stave off AMS symptoms, I'm dancing like no one is looking because, well, no one is. The re-supply heli comes today bringing with it chocolate, cheese and wine. We'll stay in camp to claim our spoils since we're sharing the re-up with other expeditions. The reminders: My climber friends know that when the annual Accidents in North America publication and podcast update, I finish them in one sitting. One of the Koreans took a tumble down a crevasse in C2 but besides being cold and banged up, he was able to walk out under his own power. Hindsight being what it is, when we were at C2, I quietly commented that they were building tent platforms without using an avy probe to check for holes first and that in Alaska, we wouldn't even come off rope until a site was probed and wanded. It was a benign, quiet observation made out of boredom as we stood next to our probe that doubled as a flag poll for our tents. Chris reminded me of this when we watched this poor guy limp back in to BC today. Had he not had his pack on to wedge him up high, it could have been much worse. I mention this not to denigrate anyone but as a reminder not to let your guard down in what appears to be a fairly safe spot. Housekeeping: I should start the summit push with all of my gadgets fully charged (headlamp, 2 cameras, phone, GPS watch, sat beacon) but a bit of moisture tripped a non-obvious temp sensor on my fancy, rugged solar battery which won't be named but start with "Goal" and ends with "Zero". I've taken it apart and isolated unnecessary higher voltage regulators and caps but it isn't a priority to fix (unless one of you has a Sherpa 50 schematic with the other temp sensor or GZ wants to mail me a new one). The panel still works but this all serves as a reminder that, "no news is good news." I'll report in from each camp with the beacon but don't expect long conversations as I'll be conserving battery incase we're up for longer than expected or need to coordinate between camps and assist others. If you don't hear from me, don't assume anything bad has happened. The weird/fun: I brought dried Reaper, Scorpion and Ghost chillies with me to season my food. It turns out, they make really good lemon, chili tea! Also, Chris has made two really lovely chocolate cakes used for both our own enjoyment but also to endear ourselves to the Spanish team which is very aligned with our own style of climbing and their doctor (Carlos) is awesome. Quality chocolate supplies are dwindling and she offered to substitute in some peanut butter. I tried to keep my composure but I'm pretty sure she knows I'll carry an extra pack load up if this happens. Not having access to a scale, a mirror, the web, or TV has been lovely. The sound of snow on our tents and distant avalanches puts us to bed at night, the warm sun and Lapka singing promises of breakfast al fresco gets us up in the morning. I often joke that our connected state at home has led us to fear being alone with our own thoughts. I miss the ease of contact with all of you but in some zen states, have managed to solve some work related and personal thought exercises that I never expected to grapple with. Yes, I've even written some code without online references. Yikes! Thank you all for your kind 160 character messages every day. Houses bought, tragic losses, loves professed, bad puns, mysteries solved, climbing victories, exams passed, single malt promised, dirty minds, 'boops', yoga poses, niece's words, Disney trips, drunk texts, good wishes, music fests, virtual hugs. I feel the love. I am blessed. For Courtney and Dan. You're in our hearts and minds.